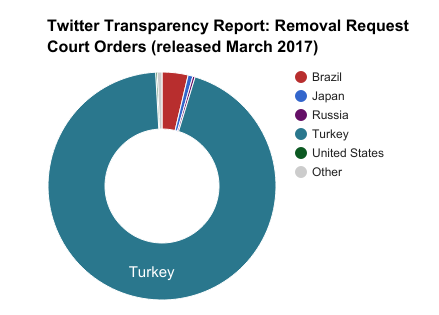 The latest quarterly transparency report from Twitter Inc. reveals that Turkey once again led globally in number of content takedown requests by court order in the second half of 2016. In its latest report Twitter has also started to publish official feedback from governments regarding their take-down policies under its government TOS section. The company has a good record of pushing back against ungrounded government demands, although it ultimately has to comply with local laws in the countries where it operates. As for Turkey, we withheld 15 Tweets and 14 accounts in response to the 77 requests pertaining to verified journalists and news outlets that we received. For instance, we withheld Tweets sharing gory images following devastating terror attacks as well as content violating a National Security Council decision that was issued after the failed coup attempt in July 2016. All of these withholding actions were taken in response to court orders issued by Turkish courts. In all instances where Twitter withheld content, we have posted copies of the underlying court orders on Lumen. Whenever possible under Turkish Law, Twitter filed legal objections in response to all court orders involving journalists and news outlets, arguing that those decisions may be contrary to protections of freedom of expression. Disappointingly, none of our objections prevailed. Turkey has been critical of journalists who express viewpoints at odds with the official government line, and now jails the largest number of media workers worldwide. In this regard, the court orders can be seen as the online extension of policies which govern traditional media formats in the country. Update: An earlier revision of this article cited a 2015 academic report which suggested that Twitter transparency figures were underreported. The accuracy of that report has been cast into doubt, hence we have removed the link.